I've been drinking a smoothie for breakfast for probably 3 years now. For me it's easy, convenient, keeps me full for hours, and ensures I eat something healthy that day. Not gonna lie, a lot of days it's the only vegetable I eat. I used to be so much better, I swear! 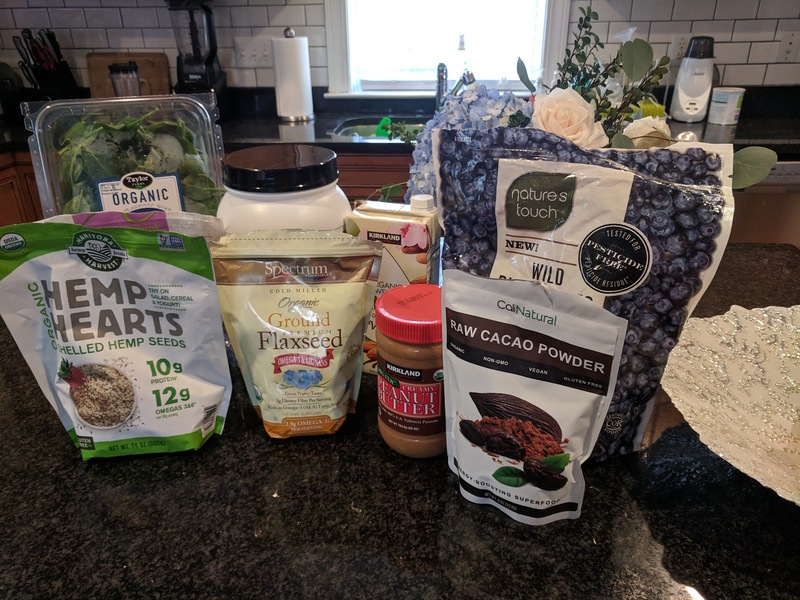 I always get questions about what I put in my smoothie, because it's A LOT, so thought I would share in a blog post. Now, this is not your typical fruity smoothie with lots of yummy fruits and sugar. It's actually not sweet at all, but it is yummy! Those fruity smoothies are delicious but they make your sugar spike and cause you to feel tired and trained hours after drinking them. This smoothie tastes like peanut butter/chocolate which to me is the perfect combination. It has lots of fats, protein, and fiber to keep your full and satisfied. Alright, let's get down to business. I usually eye ball everything so I'll do my best to make up sizes to use! I add Spinach for iron, fiber and with everything else in it, you can't taste it at all. I once read that a tablespoon a day of Flax Seed can keep breast cancer away, so I make sure to get my daily Flax! Plus it's supposed to help with your breast milk production. Whether it does or not, I don't know, but I figure it can't hurt! Hemp Hearts have protein and essential fatty acids and have no taste so they're good to add to anything to get a protein boost. Chia Seeds are also full of omega 3 fatty acids and protein. So both Hemp Hearts and Chia Seeds decrease inflammation in your body. Cacao Powder (pronounced Ca-Cow. I only know this because Theo had a customer one time who talked about Ca-Cow the whole time) is where chocolate comes from. It has no sugar so don't go thinking it tastes like chocolate. It's very bitter but it so many good benefits. It's full of magnesium, antioxidants, and it's supposed to help your cholesterol and blood sugar. I add Peanut Butter or Almond Butter, whichever I have, for the protein and because it's just good. Collagen has tons of protein, no taste, and supposedly makes you look younger so I'm all for that. 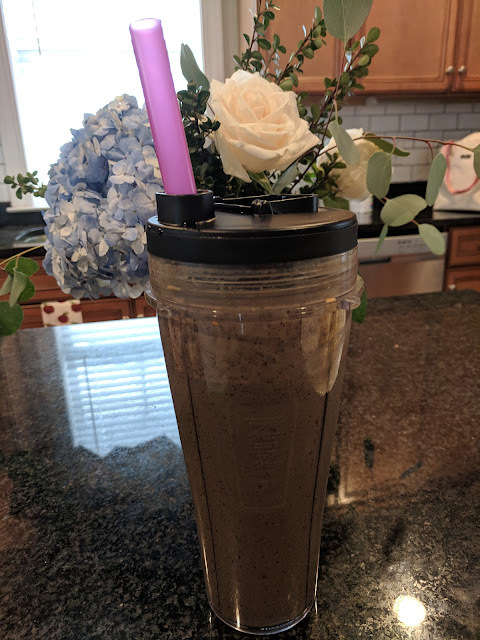 The Frozen Blueberries add a small amount of sweetness to the smoothie and they're one of the best fruits you can eat. I don't always add dry oats to my smoothie but I try to if I remember. It's another one of those foods that supposedly helps to increase breast milk plus it has protein and fiber. And lastly, almond milk to blend it all together. This blender is similar to the one I use, I'm thinking it's just the newer model. Although it is LOUD, I swear it works just as good as a Vitamix. Make sure you blend it on the "Extract" setting so it will break up all those seeds. These are the straws I'm currently using. I thought they were silicone but they're plastic and I try to avoid plastic so I'll probably find something else eventually. They do the job though! I've tried so many smoothie and I just can't get over that they are not sweet. Is this one sweet at all? No it's not very sweet, but you could add a banana (frozen or fresh) or honey or stevia and it would make much sweeter!